WordPress is an open source content management system (CMS) that is available to install using the cPanel Softaculous Apps Installer for free. 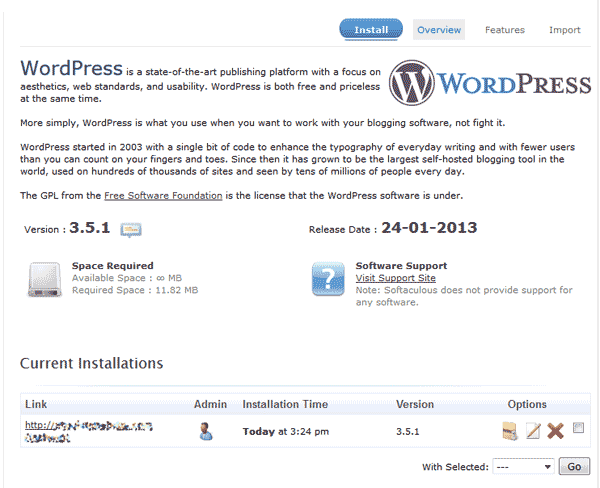 In this guide, you can learn how to install WordPress using Softaculous. For WordPress users in need of a lightning-fast hosting solution, we now have a WordPress Hosting package that has all your needs for speed and reliability covered. Click on the WordPress logo. This will open a screen with several options displayed. You will see a screen with Install, Overview, Features, and Import. Click on the Install link. Select the Domain you want to install your WordPress on from the drop-down menu. Installing WordPress on a Subdomain- If you decide that you wish to install to a subodmain, then you will need to first make sure that you have correctly created the subdomain in cPanel. The main difference is that the path will appear like this: subdomain.main_domain.com instead of like this main_domain.com/subdomain. If the subdomain is already created, then you will be able to select the subdomain from the Choose Domain drop-down menu. Installing WordPress in a Subdirectory- If you are trying to install WordPress into a sub-folder (that is not specified as a subdomain), then the Choose domain option should remain as the domain name that you wish to use for the installation. Be sure to specify the folder that you wish to use in the In Directory field - as per the example above. Now you will see your WordPress installation in the Current Installations list. Visit your website in your browser. You should see a new WordPress install like the snapshot to the right. How do I build multiple websites in a production environment? Can you have Multiple WordPress installations under one domain? Hi, I have installed wordpress. It is sucessfull and provided the urls. but when i go to the url i can see my blog site is getting opened but dont know how to add detais to my webpage. no clue. I dont see a proper not for beginners to develop using softaculous. Going black here to add the contents here. You will need to log into the WordPress Dashboard (administrative area) in order to make changes to the site. This is covered later, if you will continue in the tutorial. I installed Wordpress using Softaculous and got an e-mail with my admin url, but when I try to log in with the admin username and password I created via Softaculous, I get an error that the username doesn't exist. What can I do? I would recommend following the steps here, to reset your password. Then try logging in again. I hope this helps! www.ravenslearners.com’s server DNS address could not be found. When I look the WHOIS record for the domain up, it is showing as "not registered." I recommend contacting your Registrar to ensure this domain was registered successfully. It's seriously very amazing. Keep writing like this. What does the import option do ? Like I want to manage the content of my existing website using wordpress, to make it easy to edit. So Can I just use wordpress to manage/edit content of my existing website host on inmotion? If your existing site is made with one of the available programs in Softaculous, you can import it in and manage it with Softaculous. Here is a list of most of the available programs in Softaculous. Hi John, thanks for the help. Since I am new to this website/environment, can you please tell me how I can find out if I am using any of the available programs in Softaculous? Once you are in Softaculous, there is a button at the top right that allows you to click and see all the running applications that Softaculous recognizes. Thanks John. I am new to this environment and website. Can you please tell me how can I find out if I am using any of the programs from Softaculous? There is a button at the top right that allows you to click and see all the running applications in Softaculous. I am installing wordpress with filling everything , but shown error below ; i am not professional . Just trying by self . Pls teach how to do it ! WordPress requires an available database to work properly. This error indicates that your hosting account has reached the maximum amount of databases available for your plan. You can delete databases you are not using to free one up, or you can upgrade your hosting package to get more databases. When I'm trying to install wordpress in the Cpanel through Softaculous application it shows database error while checking submitted data. What should I do to get rid of this error? Do I need to create database prior to installation or to do any other any other configuration in Cpanel options? Pleaase help me. It would be great if someone suggest the way to fix this issue. You do not have to create the database before installing WordPress via Softaculous. We are happy to help, but will need some additional information. What is the full "database error" you are getting? Nash, this is not an option at the time of creation. However, you can <a href="http://www.inmotionhosting.com/support/edu/wordpress/333-add-admin-via-mysql">add an admin user</a> after WordPress has been installed. my query is that I've already installed a website in a hosting now I want to install another blog in that hosting. So I would like to know how I can install a new blog in that hosting. Looking forward to hearing from you soon. Muktar, before doing any operation that may result in data loss, we always recommend <a href="http://www.inmotionhosting.com/support/edu/cpanel/cpanel-file-manager/complete-cpanel-backup">backing up your valuable data</a>. To install a new WordPress without overwriting your current one, just change the "In Directory" option to a new value, and proceed with your installation. Actually I have just requested the site transfer from my old host and I have no idea about why and how all my databses are used. Now if i want to use other site how i can do it? Please help me fix this issues asap. I would suggest reaching out to Support so they can look at how many databases your current hosting package has, and how many you are actively using. You can log into cPanel and see the databases as well. Typically, each dynamic website would use one database. 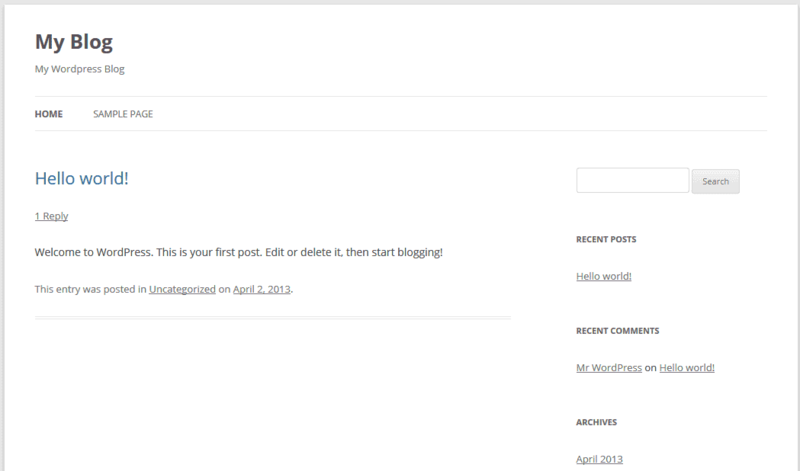 I installed Wordpress on softaculous and everything went smoothly. After the process was completed i was given two urls one was my admin one and the other was my site on wordpress. But right now i can't access any of them. When i click on the url it says that the page is not working. While installing wordpress i gave the protocol as http:// and the in directory was wp. Is that the reason I'm not able to access the website? And what do I do now? Had your domain name already propagated to point to our name servers? Propagation can take up to 24 hours to occur. If you are certain it was already pointed, be sure to contact Live Support so they can check into your specific account. I was trying to setup a new WordPress website using Softaculous installer. I've tied the new WordPress website to my domain name (theredsquirrelstree.com). My domain registrar is 1&1. I've changed their DNS settings to InMotion Hosting ones, and as I can see these changes have already taken place (I've checked it with WHOIS). Softaculous says that WordPress is successfully installed, and gives me the link so my new WP site, but when I go to that link I still see the 1&1 'sold domain' default page which says that "This domain name has just been registred". I would very appreciate some advice. TheRed, it sounds like your DNS changes have not propagated for your local DNS yet. When I go to theredsquirrelstree.com I see a message that says "My WordPress Blog", and nothing about 1&1. Please keep in mind that these changes, as with all DNS changes, may take up to 4 - 24 hours to take effect. Everything is working now, thank you for you help! You're most welcome, and have a great day! Why dont we get a "share" left menu as we would usually get when a blog is hosted on wordpress directly? How else can we have a "share to facebook" like functionality in with Softaculous plugin. Wordpress.com and WordPress self hosted are two different products and therefore what is offered is different as well. Are you trying to share a post socially? There's plugin that can help you accomplish that. i just installed wordpress using Softaculous. I left "In Directory" blank. It got installed successfully but when in click on the website url or administrative page url, it gives error message "This website is temporarily unavailable, please try again later." I checked your site and it is resolving at this time. If it was newly registered, or you made DNS changes, you may have been experiencing propagation. responial.com’s server DNS address could not be found. The domain needs to be added as an ADDON domain if you're not using it as the primary domain. If you have already done this and you're still not seeing the DNS, then you will need contact our live technical support team in order to resolve the problem. I contacted the live chat twice. They said they changed the nameserver and I should wait 4-5hours. It's now more than 24hours and still no difference. Be sure to clear your browser cache as well. This may be the issue. If not, please try Live Support once more so they can check on your account-specific details. An installation already exists at http://www.domain.com as per our records. To re-install the application please uninstall the existing installation! You will need to uninstall the previous version before installing the new one. If you have deleted the previous one without using Softaculous, you still need to run the Softaculous uninstall. Hi,I just installed wordpress with softaculous but my admin page does not want to open.When I go to: http://bornagaingamer.com/wp-admin/It just shows a blank page, and no space to log in.Ay help would be greatly appreciated. the domain "bornagaingamer.com" is not pointed to InMotion Hosting. If you're not an InMotion Hosting customer, then you need to check your PHP version. A typical cause for the white screen for a WordPress installation is the Wordpress version. If you ARE an IMH customer then please point your domain to our hosting service. For information on nameservers, please see What is a Nameserver? I have an add-on domain for which I am trying to install Wordpress. I get an error message saying that installation cannot proceed because the file already exists in the .htaccess target folder. It gives the option to delete, choose another folder, or overwrite the files and continue. I can't find this folder and don't understand what the error means. When I called tech support they said I shouldn't have a problem installing WP for an add-on domain. Help? Sorry for the problem with the .htaccess file. The problem is that the file is "hidden". The period in front of the file name is what indicates this. In order to see hidden files, you can use the cPanel file manager. The options for the cPanel file manager allow you to see hidden files. Once you can see the file, simply rename it and then you should be able to run the installation. If you continue to have problems, please let us know. If you can provide your domain name (and you're an InMotion customer), then we can take a quick look. This worked perfectly and I was able to install WP using Softaculous. WordPress requires a database to save site content, user information, settings, and more. If you reached your maximum number of databases allowed by your plan you can delete databases you're not using or upgrade your plan. OK I have installed Wordpress using Softoculus but my website is not live. why is that so ? Thanks for your question about your WordPress site. It will be live as long as your domain name is properly registered with a domain registrar. Additionally, the domain name must be an add-on domain if you are adding it as a another domain on your account with InMotion. I have already installed Wordpress on my site. I would now like to switch and have Softaculous handle the updates for me. Is there a way of safeley overwriting my current installation via Softaculous or do I need to start over with a fresh install? 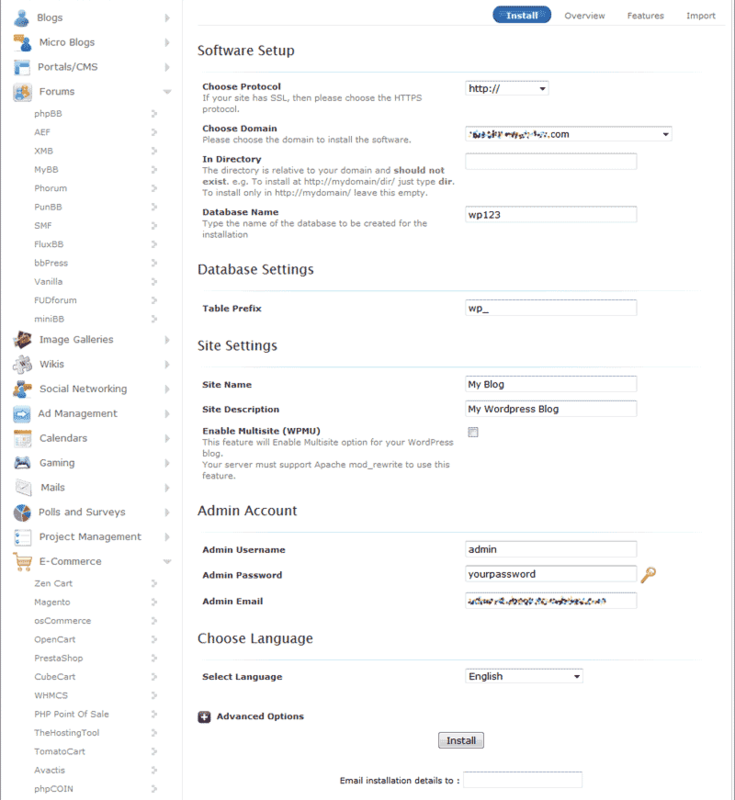 If you have installed WordPress via Softaculous you can go back and set Softaculous to auto update your software for you. There is no need to reinstall for that. No I didn't install WordPress via Softaculous I installed WordPress manually (duplicated from another website). My question is, is there a way of switching to Softaculous without having to re-intall the website template and data afterwards? I have a theme which supports still wordpress 4.4.2 only and throught softaculous it installs wordpress 4.5. All the features of these themse are not getting imported while I am importing. Can I select older version of wordpress while installing so that I can use the theme which I have? Softaculous will only install versions in the dropdown (if it supports multiple versions of that software). However, you can manually install older versions if you like. You will need to visit the WordPress archives and download the version you need. Once downloaded, manually install it on your server. This is not recommended, however as there have been several security fixes since your version. Staying there leaves your website at risk. And what do you do when there is NO softaculous on your cPanel????? You would install WordPress manually instead of using Softaculous. @TJ: Thanks. I was hoping for something a little "more" than that...like maybe there is a reason "why" Softaculous isn't on "my" cPanel on IMH ...when everyone else seems to have it? I know how to do it manually... But if Softaculous did it, I'm sure there would be "other" features to use after it's installed, like maybe backups or something? I was just wondering why I don't have the feature...Does it only come with certain hosting plans or something? It's not a big deal or anything, I'd just like to know. Thank you for contacting us. Softaculous is included on all Shared/Business hosting plans, all other plans can purchase a Softaculous license from AMP (Account Management Panel). I've completed step 6 and it looks good on my site cbaseddegrees.com now what do I do to start using it? I tried getting a WP login by registering on their site but that doesn't work when I go to "login" at my site. You must use the admin login you created during the Softaculous installation. If you forgot you can use the "Forgot your password" link and you should receive an email with a link to reset the password. I have another question which I asked 2 days ago but no response ? I intend to use the "structure" & setup of my current www.enjoylearningliving.com for a new website. How do I duplicate it to the new website? I'm not sure if you can see Scott's answer, but he did reply to your last question. If you're trying to use the same structure as another WordPress site, then you would simply need to install WordPress again, then copy over the content from your other site. Bear in mind that content paths and database would need to be unique to your new installation. We have a tutorial that may help you if needed. I installed and created some pages, Home, About, Services, Contact under the name Header in a Menu. But these title pages do not show, only the Site Title appears. I have deleted and created these pages for a few times....still fail. When you create the page, what ever you make the name of the actual page should show up as the title. If it does not can you please provide your website URL so we may investigate further? The Header does not show up while the Footer I created works fine. Please advise urgently as i intend to work on it during the weekend. I'm sorry for the late response, it seems that you changed your theme and I am seeing the header and footer now, is everything resolved? I managed to resolved it myself. One more question, if I intend to duplicate existing website to a new website (currently is blank), how to do it ? You would need to export the database content from the other site within WordPress and then import the content to the new database. Even though you deleted the website, if you did not delete the database, then you may run into a database limit as determined by your account type. See How to Delete a Database in cPanel to remove a database from MySQL and free up space so that you can make a new WordPress installation. But according to the stats on cpanel I've only used 2 of the 4. Is there something I'm missing? Thank you for contacting us. I recommend contacting Live Support, so they can look at your specific account and replicate the issue. Really nice, James. Appreciate your effort and style. Could you be a little more specific on what you mean? Are you meaning within the Softaculous tool itself? What specific URL are you using? Is the domain registered and pointed to your server? I just installed Wordpress and want to use it to for a website design template. I am moving from one hosting company to inmotion so my website has already been created, but am looking to re-do it and just give a simple look . I was finally successful getting my original website moved over to inmotion yesterday. Today I downloaded WP. But now my website says error 404, just back to your logo and says website coming soon. So sorry to see that again. Is it because i need to make the new website this miunute? Thank you for contacting us. I'm not exactly sure what you are asking, but we have a helpful article on 404 errors. If you do not want your site to display while you are building it, you can password protect the "public_html" folder. Then you can only see the site if you enter a username and password. Then, remove the password protection when you are ready to go live. I've installed Wordpress on the site but when I try to log in I get this error "
The site appears to be there, but that error stops me doing anything with it. Sorry for the problem with the 500 error. Make sure that your the PHP version set in your cPanel is set to version 5.4 or higher. Please see How to change your PHP version in cPanel for the steps in making the change if necessary. How do I make the subdomain page seen on the domain page? Is it possible to connect them better than a link? Hopefully, you understand what I'm trying to accomplish, I'm not that programmer savvy, I'm sorry. A link is the way you are going to likely connect the two programs. You may choose to add this link to a menu, or simply on the sidebar or a page itself. While with some code modification you can have the classifieds main page appear within a wordpress template, this often comes out ugly and not very fluid. I have added domain with Wordpress on it, I now want to add a subdomain that will work with the main domain site but have a separate script from Softaculous called OSClass. I don't want to make a mistake as I have not tried this before so when I get to OSClass to install onto my subdomain that I made, when I get to the part that says In Directory do I add something that will connect it to the main domain? Hopefully I'm beening clear, I'm not that tech savvy in the Cpanel area. Yes, the In Directory field is where you will tell the program to be installed. If you have WordPress in your main area, and your domain name is example.com then you will not want to leave that field blank. If you are putting it into a subfolder, then choose example.comIn Directory field, for instance: class would install it at example.com/class. If you are using a sudbomain class.example.com then you would select that from the domains list and not need to put anything in the In Directory field. I hope that helps! Thank you for letting me know. I did do a subdirectory but now not sure how to add the subdomain page or redirect it to my main Wordpress page. If I redirect it in the C-panel to my main page will it just appear? Or is there another way to add it. I'm not that savy on the back end coding so if you can explain this simply I would really appreciate it. Thank you for contacting us. We are happy to help, but I am not sure what you want to accomplish in the end. If you just want to install something on a subdomain, create the subdomain first. Then, select the subdomain from the Choose domain field when you are installing. When you navigate to your subdomain, you should be able to see your installation. My website is currently hosted on InMotion… Seeking advice on how to proceed with WordPress installation, I don’t want to mess up my current website. My website was created with InMotion’s site builder and I am concerned that I may overwrite it when installing WordPress, is there any danger of doing this? Thanks in Advance – Joe. If you install WordPress in the same directory that you have the builder site in, it will overwrite the index.php file. This file is very important as it is the first page visitors see. That is likely the only file that will be overwritten but it is enough. If you wish to install WordPress onto your site and not interfere with the existing site, simply install it in its own folder. Step 4 has the instruction you need. Look at the "In Directory" part. If it is installed into its own directory it will not have any effect on the current site. I would like to install wordpress, and then learn how to use it, and re-build our site. I don't want it to go live right now, because I need time to learn to use Word Press and build the site. I currently do it using Dreamweaver. I am thinking that I need to install it in a subfolder, so it does not interfere with the existing site, until I am ready to deploy it. Is that correct? Will it be difficult to move once I am ready to make the switch? Installing WordPress to a subfolder will allow you to easily make changes without affecting your site at all. To do so, you can simply enter something with the In Directory field of Softaculous. Once your site it built and ready to deploy, you can actually use the Softaculous clone feature to move it to your main production environment. I am super confused as to how installing Wordpress and using it to for a website design template. I am moving from one hosting company to inmotion so my website has already been created, but am looking to re-do it and just give a simple look with ecommerce capability. As I am navigating through themes using Wordpress how am suppose to make the changes and then connect it to my website? Thank you for contacting us today. If your existing site was already built in WordPress, I recommend following our walk-through guide on Migrating your Existing WordPress site to InMotion Hosting. You can also request a website transfer from AMP if you need assistance. If your original site was not built using WordPress, you will have to install WordPress as described above, then build your site. We have a full WordPress Education Channel, with walk-through guides that will help familiarize you with the software. You can add e-commerce functionality to a WordPress site with a plugin. Every time I try to install Wordpress I get an error that says: "The maximum number of databases you can create has been reached, so installation cannot proceed." I've never installed Wordpress before for this site and I've checked the MySQL Databases and none currently exist. I have no clue what I am doing wrong. Any suggestions? Can you please provide us the domain that is associated with your account so we may investigate further? Also you can contact our technical support team and they would also be able to assist you. The website is ledotax.com. Thanks! I took a look into your account, which there were some issues with your package. This has since been resolved. how do you delete plesk sitebuilder from my files. So I can down load worldpress. There is no tool for deleting the sitebuilder files. You can, however, go into the cPanel File Manager and delete them manually. From there you can then install the WordPress. Better instructions on how to make the URL for my forum. I installed the forum but can't access it because I don't know how to find the URL. Which forum do you mean? Do you mean the WordPress software? If so, when you install it, it displays your URL on the screen as soon as it is done installing the files. It gives you two URLs, one for the main site and one for the admin login page. You can see the screenshot for this on Step 5, though the URLs have been blotted out on the image. A subdomain is attached to a folder, typically with the same name. (ie: blog.example.com would be found at example.com/blog) Using this example, you would enter the folder name associated with the subdomain, which is 'blog'. Enter it with no quotes or slashes. Wordpress will then install the files into that folder for you. I just opened an account yesterday and had Wordpress set up by the admins. I checked my site today and saw that they had it set up but they did not provide me the Wordpress admin username/password. How do I get the Wordpress admin username/password or Can I reinstall Wordpress myself to set up the username and password ? The credentials are sent to the primary email account for the hosting account. Be sure to check the Spam folder to be sure it was not sent there. If you wish, you can certainly remove the installation and then reinstall it via the Softaculous program. Sorry to hear that you're having problems. Can you provide us the domain name that you're using? If youre domain name is new, then you may be seeing a delay due to domain propagation. Newly registered domain names do require up to 24 hours before you can use them on the internet. This is because the internet needs a little time to recognize your domain name after you register it. If you continue to have the problem, please provide us a domain name and we can check on it for you. I just installed wordpress according to your guideline...leaving the In directory balnk but my post url shows .....domain.com/blog. Is there any solution ? The 'In directory' field prefills with the value 'wp' not 'blog', at least on our servers. If it is showing up at example.com/blog it sounds as if it was mistakenly put there. If you have not yet begun with creating the site, it would be best to uninstall and then reinstall it from within the Softaculous. you are right, I leave In directory balnk and my site url is example.com...but when i publish a post, the post's url shows example.com/blog/post-title. where is the problem ? Thank you for your question. This means you installed WordPress into a folder called blog. Possibly your Softaculous was customized to install into a /blog folder. Can you provide a link to your website? This will help us identify if you have an account with us, and allow us to look further into your setup. It looks like you installed WordPress to your account with us already which you can verify by looking at your cPanel File Manager. So if this is the second time you're running through the Softaculous install, and trying to again install it to the main directory it's going to fail because all of those original WordPress files still exist. You would want to modify your hosts file, or change the WordPress URL to use your temporary URL in order to access your website on our server since it's not currently hosted there live yet. If you just try to go directly to your domain right now, it looks like it's currently hosted at another web host. Once you are ready to point your domain name over to us, you'll want to update your name servers to point to us. Confused about whether to install WordPress in the domain directly or in a sub-folder. What is the difference. Also, I plan to include an ecommerce element later down the road. Should I select HTPPS protocol now, or can I change it easily later when I add the ecommerce (such as Presta)? Finally, what is Table Prefix? Do I create my own name for Table Prefix, or are their specific prefix entry that should be used such as WP_? Thanks. If you want your visitors to go to something like example.com/blog, then you would place it in a subdirectory named blog. If you want it running on your main site, leave the filed blank. It is quite easy to change the installation to HTTPS later. If you already have an SSL certificate set up for your domain, selecting either will not affect you but if you do not have an SSL certificate, do not select the HTTPS option as this can cause the site to not work. The table prefix simply obscures the table names which can help with security. What you put here is completely up to you. I am not exactly sure what you are asking, but if you want to host your website on wordpress.com and use your personal domain name, you can Map an Existing Domain. If this does not answer your specific question, please provide more details regarding what you are trying to accomplish. Thank you for your question. 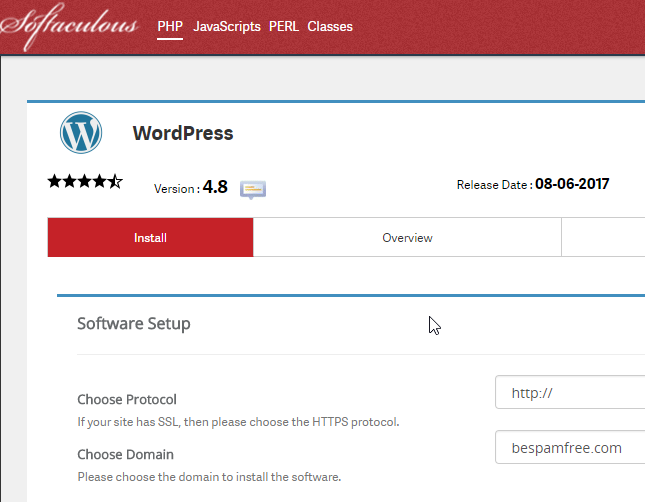 When you install Wordpress from softaculous, it simplifies the process of downloading Wordpress from Wordpress.org, and installing it. It will then be hosted on your server with us, and you essentially have more access/control of your account, than you would with wordpress.com. This is a nicely done installation script. A newbie will be able to follow the procedures easily.